Apple on Monday issued a minor update for iOS, fixing a problem that could prevent some users from viewing data in the Health app. 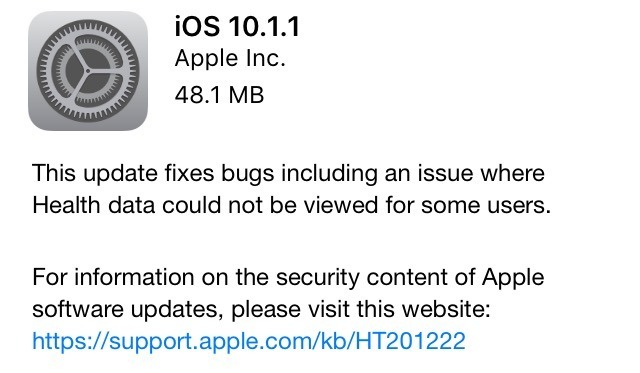 iOS 10.1.1 is now available to download via Software Update or when connecting an iOS device to a Mac or PC via iTunes. The lack of betas prior to Monday's release suggest that there many not be any changes beyond the fix for Health. The update arrives just one week after Apple released iOS 10.1, bringing the new Portrait mode photos to the dual-camera system on the iPhone 7 Plus. That update also added transit directions and Apple Pay for users in Japan. Since it was released in September, iOS 10 has been installed on 60 percent of active devices, according to Apple's own data. Another 32 percent remain on iOS 9, while 8 percent of users are running iOS 8 or earlier.